Push / Pull is developed from the perspective of a world in which network communication play a growing and growing role. The internet is more and more used to, besides text, communicate image and sound. How ever the internet is almost not used for direct interaction. 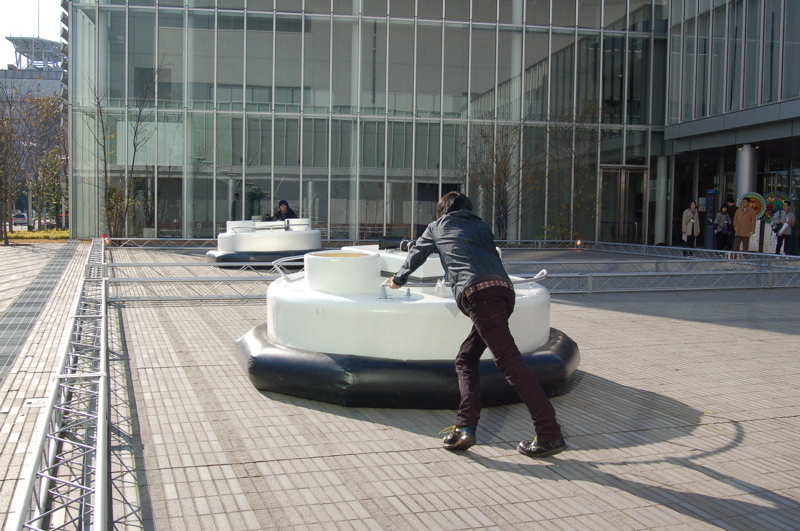 Push / Pull is a research at physical and tactile communication via a network. One important contradiction is the fact that in the real world communication has a continues character over time while digital communication is always discreet. Information is communicated is chops. Push / Pull is not a project looking for the ultimate communication device which should imitate the real world experience but is emphasising the qualities of a certain medium. The objects have their own communication qualities but also have their own character. Within the conversation between the objects the behaviour is changing and partly directing the conversation. The objects are placed in two separate spaces of at least 10 by 10 meters each. 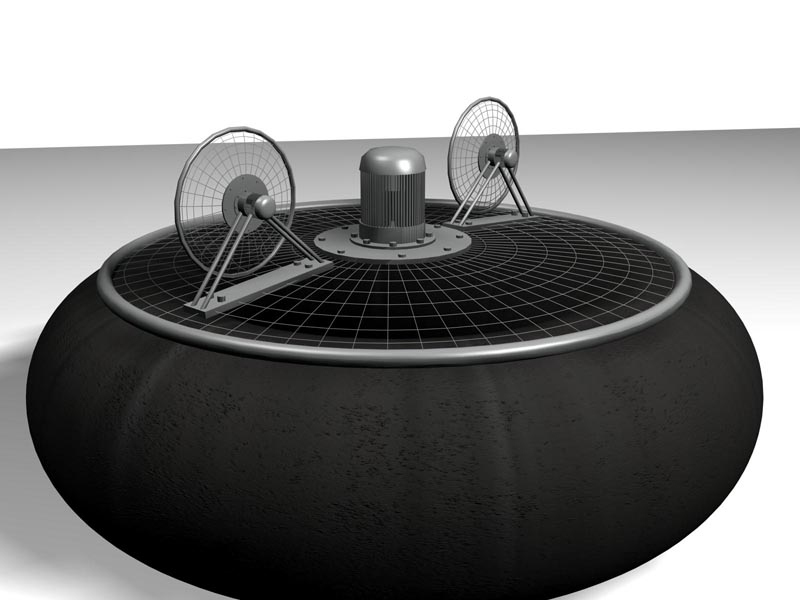 They have a diameter of about 2,4 meters and are fully controllable in movement by two omni-directional wheels that have contact with the floor. The shape is round which creates a situation in which there is no front and backside. On one hand the movements of the objects is determined by their programmed behaviour but on the other hand this is permanently influenced by the movements the audience gives them. Their route is the sum of the input from the audience and there own behaviour. This is permanently communicated between the two objects. Although a visitor is touching one object it is also influencing the other object (and the other way around). Although the visitors are in different spaces they can 'feel' each other through the objects. As earlier described there is a direct relation between the movements of the two objects. De visitors can 'touch' each other through the two with each other communicating objects. However this is not the only form of interaction. The objects have their own kind of behaviour which can change over time. This behaviour is determined by two parameters. First of all the objects memorise the moments they are given by the visitors, reproduce them and process them into new movement patterns. Because of this aspect the visitor is being confronted by itself. Secondly the specific place of the objects in the space can play a role in the behaviour. This behaviour is comparable to an object in a complex magnetic field. The object can have a pulling force to a specific place in the space. The object is attracted by that location and wants to return there all the time. Also there are locations that have the opposite role. They keep pushing the object away. De balance of the different forms of interaction is dependent of what the visitors do. 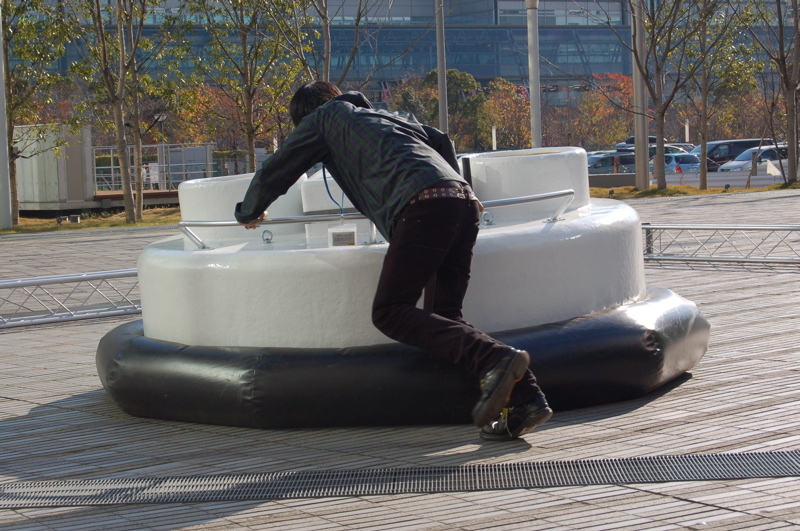 The behaviour is changing over time, which temps the visitors to keep exploring the installation. Both objects are controlled by there own computer. The communication in-between the objects is realised by a network connection between the two computers. 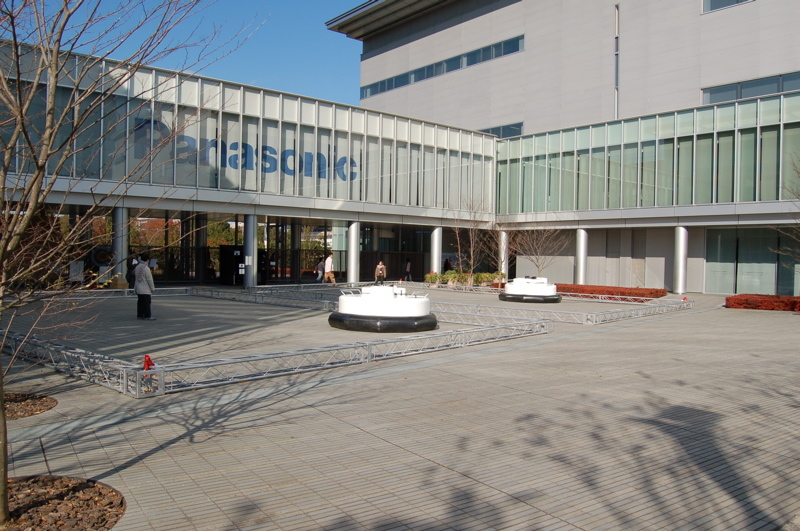 This network connection will be local when the installation is presented at one location. There is an internet connection between the objects when the two objects are presented at different locations. Certain forms of interaction will still work while other forms of interaction will be adapted to the medium (internet). The delay, which is part of the medium, is incorporated in the forms of interaction. 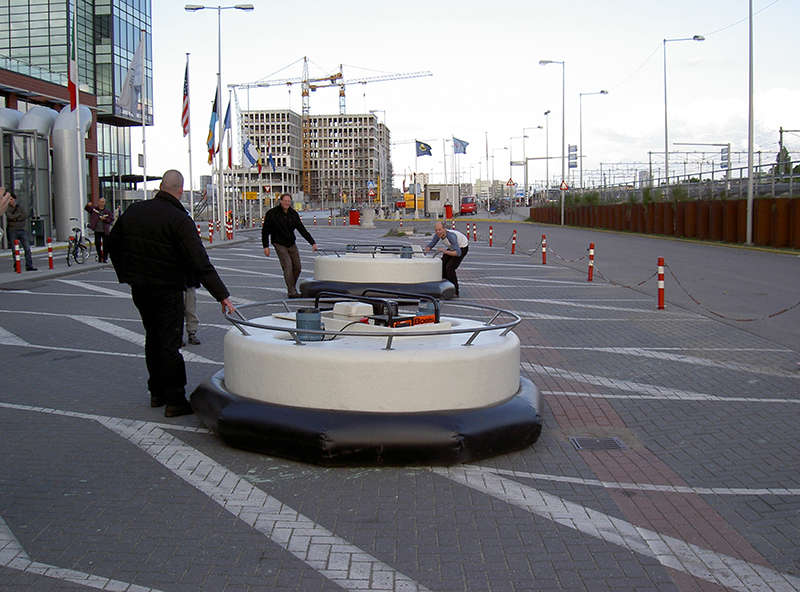 The objects are round with a diameter of 2.4 meters. They have an inflatable rubber ring on the outside. 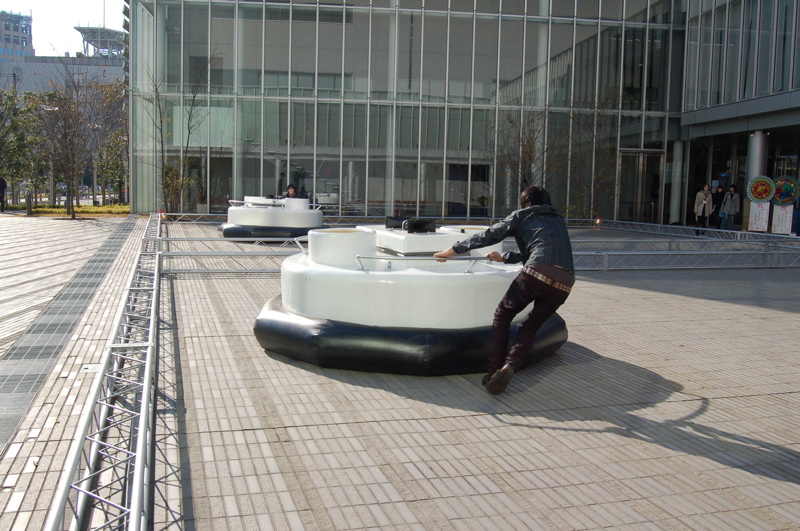 The ring softens the object as it bounces against the visitors and the walls of the space. 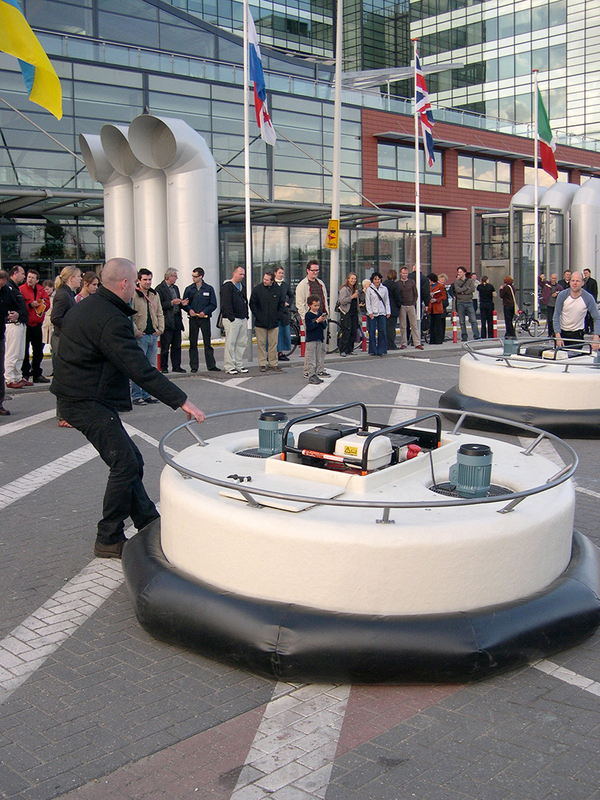 The weight of the objects is flying above the ground with the hovercraft principle, this technique enables to move the large objects rather easy. 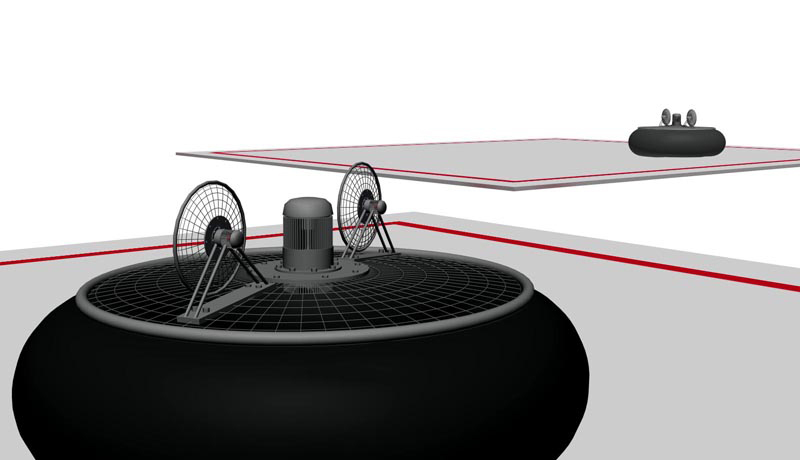 The two omni-wheels are the only part of the objects that have contact with the ground. These wheels are hanging underneath the air cushion as a separate unit. 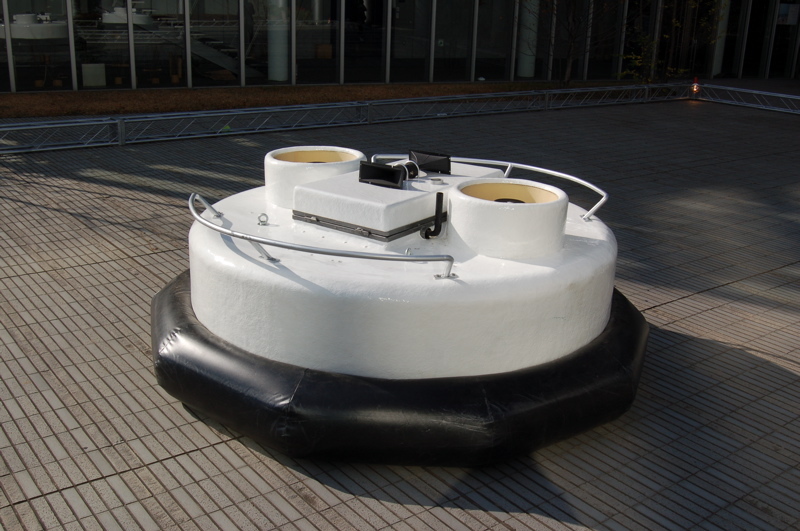 This unit can move freely so the wheels keep in contact with the floor at all times, not influencing the flying behaviour. The objects can spin around its centre and also move linearly. The objects can move very controlled. Sensors are being used to determine the location and the rotation of the objects in the space. From the location the speed and acceleration can be calculated from which a very precise control of the movement can be accomplished. The objects have a build in speaker. 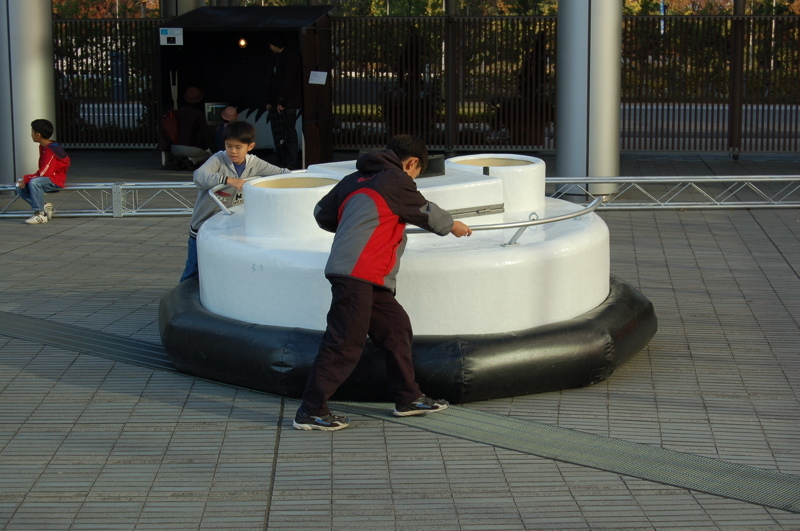 The sound forms another level of communication with the visitors independently from the movements. The object can express itself via sound. The objects speak their own language. The sound will continuously express the state/mood of the object. The speed, the location and the direction of the object are influencing the sound but also by the visitors which move the objects. The object can express whether it wants or doesn't want to be moved, whether it is pushing against you or moving with you and give information about it's location in the space. The sound forms another dimension in the communication between the visitor and the objects.